"Our new Matterhorn Metal roof is stunning! My wife and I were impressed by the skill demonstrated by the Freedom crew. " Our new Matterhorn Metal roof is stunning! My wife and I were impressed by the skill demonstrated by the Freedom crew. Thank you Freedom and great work! Recommendations from trusted neighbors. Consideration and attentive follow up from sale person, Brian Sweet. "He was very nice and welling to make everything right"
"Good reputation, good price. And excellent work." Good reputation, good price. And excellent work. If you’re looking for a roofing and restoration company dedicated to customer service, you’ve come to the right place. Freedom Restoration & Roofing has many years of experience providing local homeowners with the peace of mind they need after a storm with our high-quality roof repairs and replacements, and gutter installations and repairs. 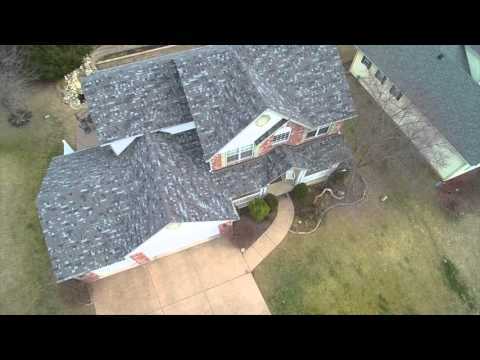 Certified through Owens Corning, and Best Roof, our services are thorough and skilled. We always go the extra mile – we even use a drone to provide images on every estimate so our customers know exactly what we’re up to! Our highly talented technicians are sure to restore your home efficiently and effectively. Co-owners Jason, far right, Ryan, far left, and their families. 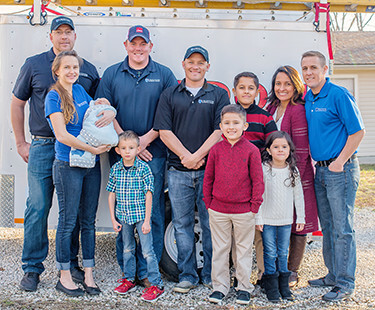 Jason Sweet and Ryan Walker, co-owners of Freedom Restoration & Roofing, both bring valuable experience to their jobs that allow their company to succeed. Jason served in the U.S. Army for four years active duty, where he learned a great deal about leadership and responsibility. He also has three years of experience working as a union carpenter and a further two years of owning his own small business. When it comes to operations, Jason knows what to do! He loves helping people and providing his customers with the best solutions. Ryan similarly has extensive knowledge in leadership practices and the roofing industry. He began working in the industry in 1999, and by 2004 he was leading in sales and was promoted to Sales Coordinator in a competing company. In 2009 he achieved the position of Project Coordinator, which he held until opening Freedom Restoration & Roofing. Ryan oversees all aspects of daily operations with a passion for excellence and a dedication to offering the highest quality services to his customers. Outside of work, both Jason and Ryan enjoy spending time with their large families – Jason has three children and Ryan has four! Jason is a weekly volunteer with his church’s youth group and a die-hard sports fan. Ryan also participates at his local church and enjoys boating and camping. Here at Freedom Restoration & Roofing, we consider ourselves to be leaders in the restoration industry. We want you to know that if your home suffers damage in a storm, our employees know what to do to minimize any hardship you might be facing. As insurance experts, we’ll take you through the claims process from start to finish – we’ll handle the paperwork so you can focus on more important issues!